My eagerly-awaited Chromecast arrived a couple of weeks ago. Despite the reports that Google had run out of Netflix codes my 3-month streaming code arrived a few days before by email – a great deal given that it is also valid for current Netflix customers too. The device itself is a rather small affair about twice as long as a HDMI connector and a little wider and thicker. Some people are upset that it needs a USB power cable given the promo shots show no such cable. HDMI however only supplies 50ma of power wile USB supplies 500-900mA. 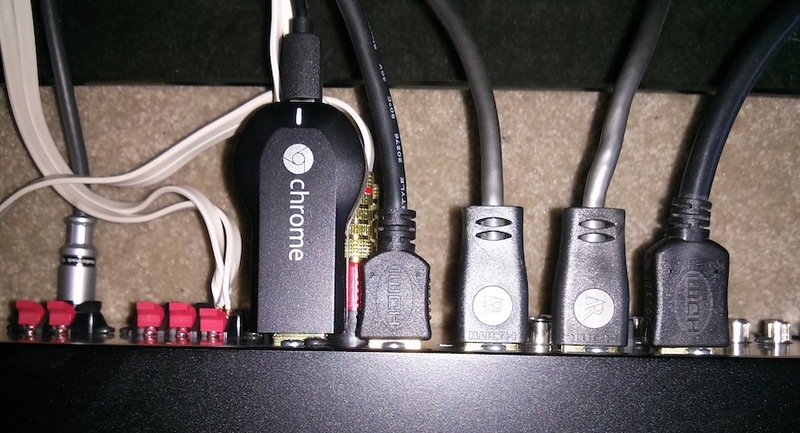 Chromecast is a small computer with 1080p output and Wi-Fi so it’s going to be needing a lot more than HDMI can supply. If you were hoping HDMI 1.4 would address that you’ll be disappointed. My Yamaha receiver/amp is the hub for my system and all devices have to go through to get sound (it also makes switching device simpler). My amp lives in a small confided space below my TV which reduces the Wi-Fi range but the Apple Time Capsule is near enough for a strong single and indeed the spare USB port it has provides power. Once connected and powered up you’ll be presented with something like this on your screen which cycles through one of many beautiful background images both during setup and when idle. I’m not sure if the images are location-aware or Google chose it because they’re also in the bay area. 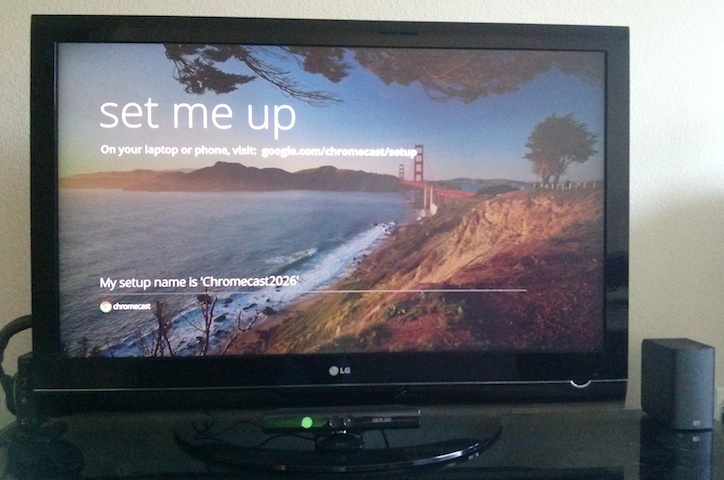 Chromecast starts up with it’s own temporary wireless network. Then you download one of the two setup programs for either Mac or Windows and it will switch you to that network (with no warning, I hope you weren’t downloading anything) and will prompt you for your Wi-Fi details. With any luck it will switch Chromecast over to that and it’s up to you to switch your machine back. A WPS option would have eliminated the need for downloads and disconnects but given how few people know about WPS (it’s very hidden away on my Time Capsule) it’s an understandable omission. 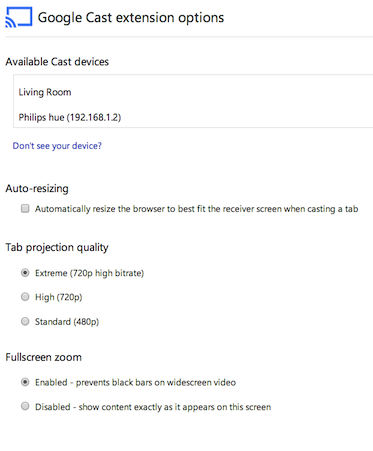 The Chromecast is a very lightweight device and as such you need another device to control it. My wife and I both have iPad’s that are normally nearby so this is primarily the source of plays. Once the show or movie is playing you get artwork for the show and a bunch of controls to move forward/backward, change audio and subtitle options or go back. Hidden behind the stack of cards at the top is the episode menu for switching episode or season. 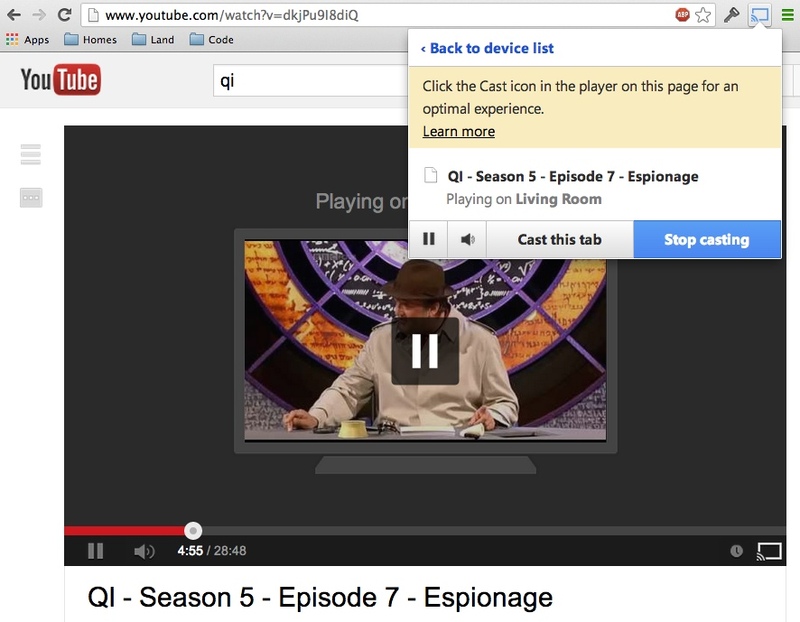 This is useful as there isn’t yet a “post-play” experience to take you to the next episode automatically. I ran into a problem that should your HDMI link be interrupted or your iPad sleep you may get the error I captured below. 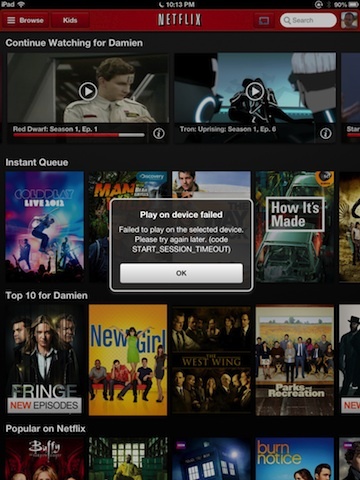 If you do you’ll need to quit the Netflix app and restart it to regain control. 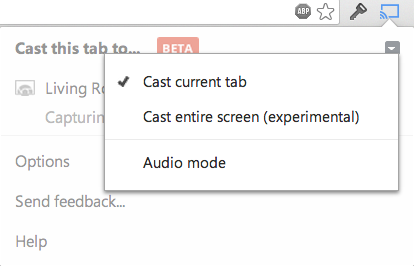 Running the Silverlight based player from the website also reveals the cast icon tucked between subtitles and sharing on the playback control but only if it is running within Chrome and the extension is installed. This works on both the PC and the Mac despite Silverlight for Chrome on the Mac never becoming officially supported by Microsoft. Thankfully Chromecast solves a couple of these. Re-buffering and full-screen performance are great here. 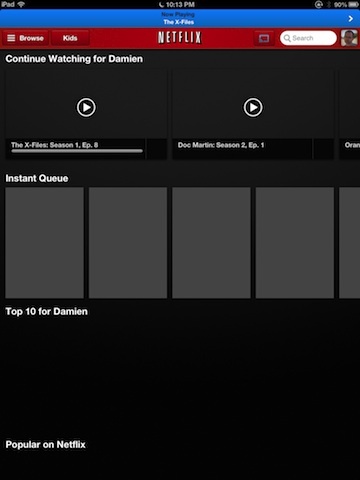 Just find your video and hit the cast icon at the bottom right to choose where to start it in a similar way to Netflix. 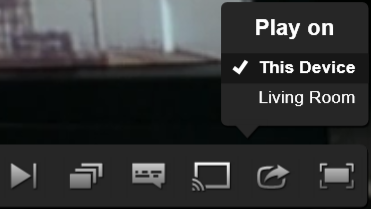 If you try clicking this icon to cast either YouTube or Netflix you’ll get a warning telling you to use the icons within the players themselves. This is a bit clunky and I would imagine Google will improve the interop here in the future so you can just always use the Cast button. There are also various options available to control how things look on the screen. Rendering quality is okay from a distance but a mess close-up most likely due to the 720p limit and some sort of scaling going on. 1 pixel lines and curves are a mess as is small text. Usability is okay as long as you are looking at your laptop and not your TV as there is no mouse pointer, context menus, toolbars and a second or two of lag even over fast solid Wi-Fi. 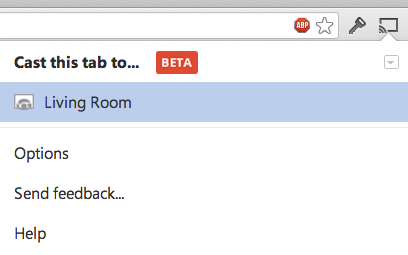 Weirdly selected text shows as selected and web sites with hover effects show that effect even with no mouse. I think these omissions and inclusions are simply the result of what Chrome renders via WebKit rather than a rational set of choices. Oddly I received performance warnings on a MacBook Pro 2.6 GHz with no major apps running. This could give offices a very cool and simple way to setup sharing for presentations in Keynote/PowerPoint without the dreaded hunt for the right cable or adapter that always seems to happen. Lag was also improved when dropping down to lower resolutions. 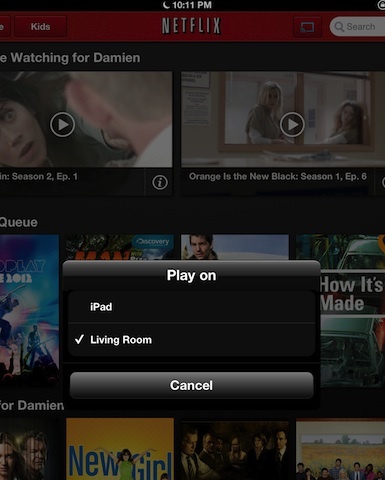 More streaming services are coming so that’s covered. Getting DLNA support (or indeed Airplay for Mac loving friends) will probably require some open source efforts. Thankfully Google have the start of a Google Cast API/SDK available so that should just be a matter of time. The wireless second display option would be awesome for developers, testers and presenters. Let’s hope somebody figures that out. The Chromecast is a great device. Additionally instead of watching YouTube on our laptops we just cast them over to the big screen and sound. For $35 it’s an absolute steal. 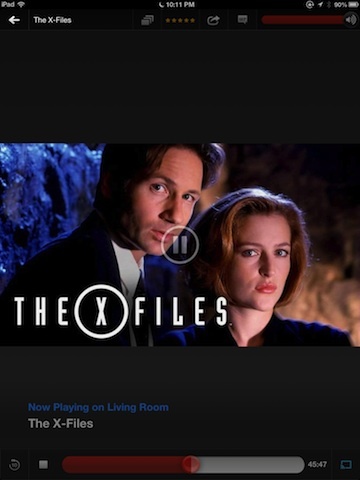 Disclosure: As a former Netflix employee I have stock options in Netflix. For $35 it’s a nice interface, but I’d actually prefer to pay more for something that does a bit more than just streaming from other devices. For slightly more maybe they could make something which could run the Netflix Android app in its own right - I have the choice between streaming and local apps for some things on my AppleTV and I much prefer it when I don’t have to worry about the iPad battery or having a laptop open (Spotify is the main one I still have to stream and wish I didn’t have to). Maybe they were just burned by GoogleTV because most consumers aren’t that interested yet (nor did AppleTV sell that well I think) and wanted to try something super cheap to get attention, and they delivered well on that, I just wish it went a little further.